I just can’t believe that there are only 2 weeks of the school holidays left. It seems that just yesterday that we were at the last day of term, and planning what we would do with our time and what adventures we would experience. Yet today I found myself uniform sorting, shoe buying and making that all important list of what else is required before the start of term. To be honest it still seems like there’s plenty of time to enjoy the holidays but I know it will evaporate in a flash. A little while ago the girls were thrilled to received some personalised bedroom accessories from Stuck on You which we all love and look great in their rooms. Now that the back to school is looming they are really pleased to have been sent some personalised back to school items. Firstly our very grown up 9 year old chose a brand new personalised pencil case. Moving into year 5 now means she has to take one into school with her filled with just a few classroom essentials and this was just the thing. Bearing her name might make it easier to keep track of (I doubt that though to be honest!) but it definitely gives her a greater sense of pride about her belongings. I like this. Made of cushy neoprene fabric this pencil case is HUGE! We really didn’t realise how large it was going to be and were seriously impressed when it arrived. At the moment, she’s using it to store her knitting and handmade friendship bracelets (so cute) and it even came on holiday with us. 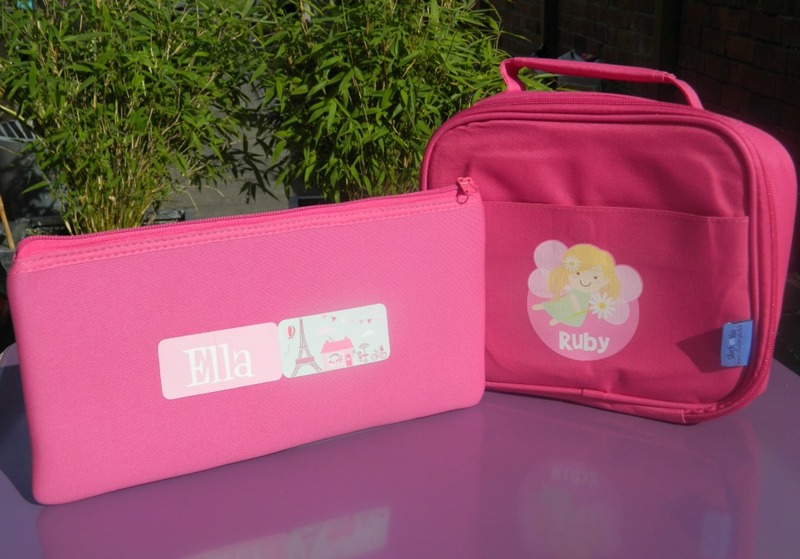 Whether it will make it to school I’m not sure but it really is a great item that takes pride of place on her desk.The large personalised pencil case retails at £15.99. Secondly our 6 year old was very keen to have a new lunchbox. The personalised lunchboxes from Stuck on You are gloriously pink, sturdy and well made. Perfect for a girly 6 year old, she was able to design the cover and add her name plus font making it much easier for her to find on the daily rummage through the lunchbag box in the classroom. As a parent I really liked that this bag came with a water repellant lining making it easy to keep clean. Left over yoghurt makes a heck of a mess! The personalised lunchbox starts at £18.99. So overall we love our new back to school gear. Stuck on You is an innovative, easy to use site full of great gift ideas and practical, personalised products. I love the way you can select different styles and patterns for the logo or motif and then add the name in different fonts too. It really makes the item unique and personal, and helps the children take extra pride in their belongings. Thank you to Stuck on You who sent us the two items mentioned free of charge. The opinions and comments are however, genuine and honest.